Edit photos the way you imagine, making them matter more! Do you want your photos to look better… to look amazing? Do you want to learn the world’s most powerful and efficient editing application, used by professional photographers? If so, you’re in the right place – and we’re happy to have you here! It’s great to have you here. WE LOVE PHOTOGRAPHY and PHOTO EDITING! Maybe you’re an amateur photographer who has done a little bit of photo editing, or maybe you have quite a bit of photo editing experience. Either way, we’ve made this course to help you make images that matter. Start editing photos in Adobe Lightroom Classic CC (formerly Lightroom CC) today! You’ve always wanted to learn how to easily edit your photos. Lightroom is the perfect tool for you. It’s robust, yet intuitive. This course will teach you everything you to start photo editing today. 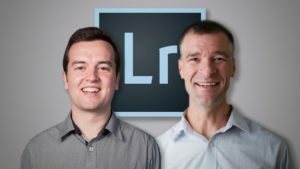 We are Phil Ebiner and Jon Haase, and we’ve been using Adobe Lightroom for over a decade. We are professional portrait and wedding photographers. We run photo studios. And our photos have been featured in major publications. We want to make this the best course on how use Adobe Lightroom. So if there is any way we can improve this course, just tell us and we’ll make it happen. Whether you are using Lightroom CC or a previous version, this course will teach you how to use the program to its fullest potential. When you are done with this course, you’ll be able to edit your photos in Lightroom like a pro. You’ll be able to set up Lightroom so it will run its best saving you hours of frustration and you’ll have the confidence that you’re not going to lose your images. You’ll also be able to professionally retouch images and you’ll spend less time doing it with pro Lightroom tips and tricks. You’ll also be able to do pro camera calibration and custom white balance corrections, a remarkably powerful advanced one button correction. We’ll do this by covering Lightroom setup and configuration, exposure adjustments, adding drama through clarity, mastering Lightroom presets, covering top Lightroom plugins, organizing images in Lightroom for Mobile, editing in Lightroom for Mobile, recovering details in shadows, how to edit a landscape photo, how to retouch a portrait, and much more. Make your photos shine with this great course. Each lesson is available for download, so you can take it with you wherever you go.